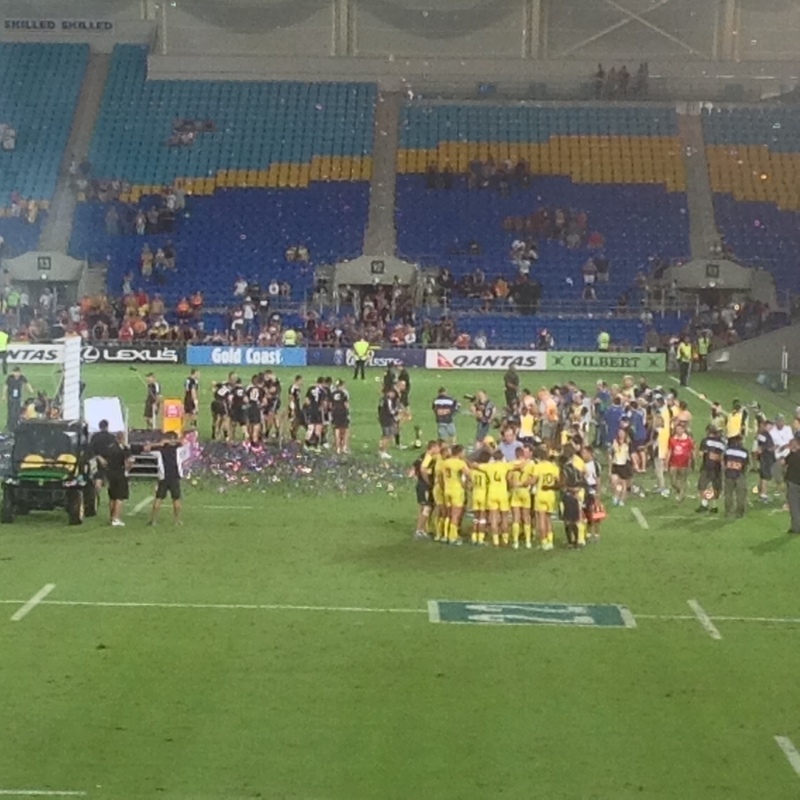 The Gold Coast 7s party is over for 2013 and the Kiwis finally claim the spoils after two exhilarating days of action defeating the Aussies 40-19 in an exciting Cup Final where initially the local team lead 12-0 after two quick tries. All the weekend action was hot on and off the field with the Robina Stadium bathed in glorious sunshine, until the twilight sessions began, of course. 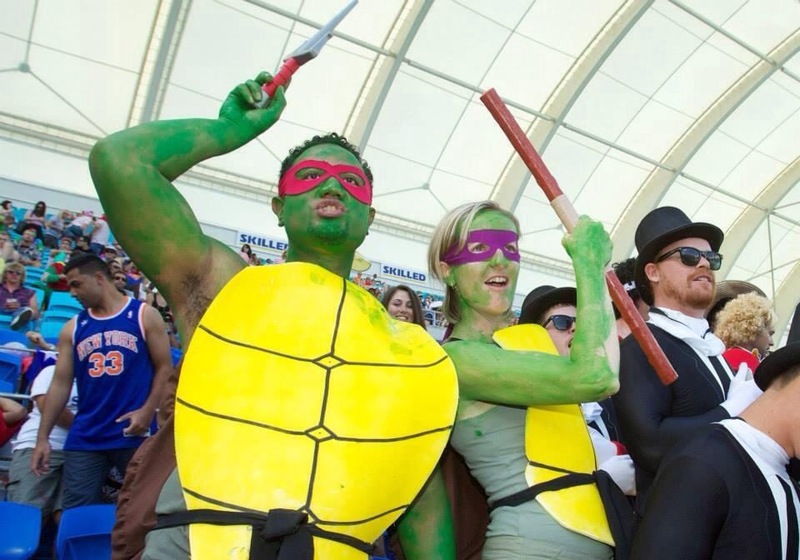 The usual costumed spectators from ninja turtles to ostrich jockeys were in the crowd to support Round 1 of the HSBC Sevens World Series. Last year’s winners Fiji, under new coach, former England boss Ben Ryan, proved not quite up to their usual high standard. Despite a loss to Wales they did top Pool C, however they squandered this opportunity losing to England, 12-26, in the Cup quarter final. As a consolation, they did win the Plate with a rousing 36-0 victory over Kenya. The Bowl was won by France 19-14 after a strong challenge from Canada that went into extra time. France were relegated to the Bowl after losing 5-29 to South Africa and 12-26 to England in Pool B on Saturday. Canada were their due to a count back in Pool C, where the top three teams finished on 7 points. Fiji were given the top berth with Wales second. Team USA took out the Shield Final 22-0 over Portugal, after coming third in a tough Pool A with the likes of New Zealand, Tonga and Kenya. England showed the talent they had in their stocks by defeating South Africa 47-0 in the play-off for third. After a mammoth Cup semi-final loss to Australia 19-24, South Africa, were just too weary to put up much resistance to an English side that had scored the first points against New Zealand for the tournament in their 5-14 semi-final loss. But, the New Zealanders, as they showed all tournament, with an unblemished score line after day 1, that they were always going to be the team to beat. Under coach Michael O’Conner the Aussies came out firing in the Cup Final leading 12-0, however their draining semi-final with South Africa, that went into a second 5 minute extension, proved too much against the much fancied Kiwis. Rugby league school of excellence, Keebra Park State High, proved their versatility by once again winning the national schools sevens title 24-10 over TSS in an all-Gold Coast affair. Forced off the main oval to Robina station reserve due to Australia’s semi-final double extra time with South Africa did not deter from the determination for Keebra Park to secure their fourth straight 7s title, extending their unbeaten record to 40 matches. Numbers attending the two days were 25,320 which is down on last year’s 27,000+. Rugby Union boss, Bill Pulver, will be sitting down with a team of professionals to see how an improvement can be made to have more people attending. The Gold Coast contract is up next year, 2014, and it’s important to keep this location leading up to the 2018 Commonwealth Games, which has sevens, as the Gold Coast is the host. 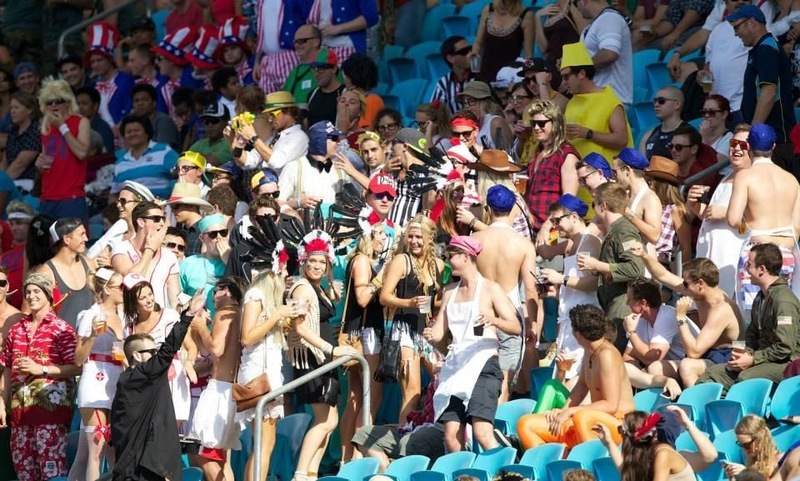 The first round of this season’s World Sevens rugby junket 2013/14 started at 10:30am on the beautiful Gold Coast with New Zealand playing USA in their Pool A match. The Kiwis were victorious over the Americans 38-0. This was followed up by the ever improving Kenyans, with a huge supporter base, smashing the Tongans also by 38-0. With a rain shower threatening, the action was boiling over on the field. And when the Aussies squandered a 21-0 lead over Scotland to draw their match, upsets were looking like a strong possibility. Australia then accounted for Argentina 22-7 in the following match with their eyes firmly focussed on the 7:46pm match with Samoa. In the meantime New Zealand was progressing through nicely, easily beating Tonga 26-0 and defeating Kenya 31-0 in the twilight to top Pool A. Last year’s champions, Fiji, were looking alright until they lost to Wales in their last Pool C match 19-22 to Wales. Since Wales had lost 17-24 against Canada earlier in the day the top three teams all finished on 7 points. On count back Fiji topped Pool C.
South Africa had an impressive first day defeating France 29-5, Spain 38-7 and a strong England side 22-14. They topped Pool B and will play Wales tomorrow in the Cup quarter final, with England placed second in Pool B they will have to face Fiji in the quarters. 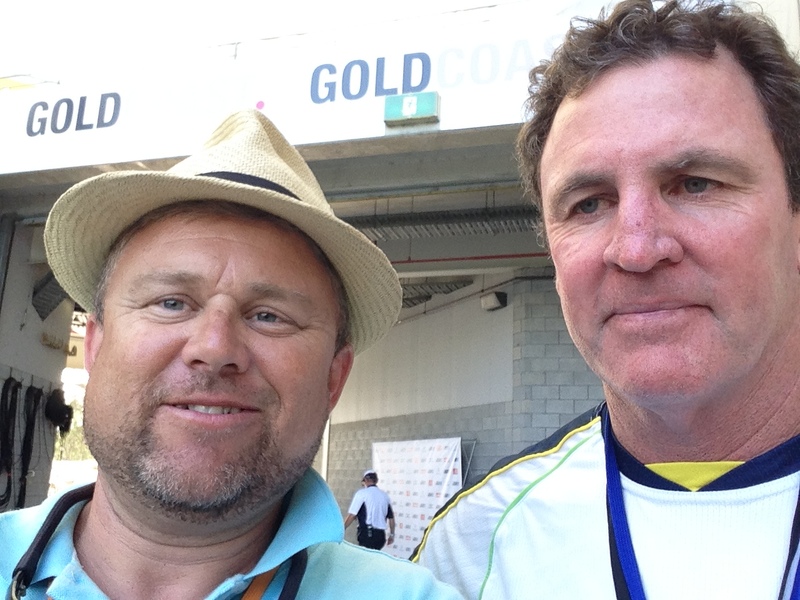 The Aussies played some of the best rugby I have seen them play to defeat Samoa 12-0 nil in the final match of Day 1. Thereby topping Pool D, which sets them up for a quarter final with Kenya tomorrow at 12:42pm –just like last year when they beat eventual champions Fiji in their last pool match. With Samoa coming second in Pool D, they will have to play the Kiwis at noon in their quarter final. Basically going to form, Sunday’s action is going to be a mouth-watering feast of 7s rugby. If you are still without a ticket there are a few available at the gate so come on down.